People say the J/22 is the best sailing boat they've ever been on, including other J's. It's responsive, stable with its fixed lead keel and safe, as much fun to single-hand with main only as it is to plane under spinnaker in 18 knots of wind. J/22 at 1800 lbs. can be towed behind an SUV and be launched on the local yacht club hoist. With its easy-to-rig, deck-stepped mast, you can be from trailer to sailing in 30 minutes. The key to J/22's success as a training boat is durability. It's no wonder Sail Newport and College of Charleston love this boat. Hulls and decks are built with Baltek cored laminates to withstand years of hard use. 12-15 year old boats routinely win major J/22 championships. You'll find the newest J/22s are even easier to maintain with stainless handrails and white composite toe-rails. The boat that appeals to all ages and skill levels is now garnering more interest than ever before. J/22 is the choice of one-design fleets and institutional sailing programs worldwide, because she has proven to be a great value and a favorite among juniors and adults alike. The hull and deck are unyielding Baltek balsa cored laminates. All deck gear is first class and located in accordance with the latest class preferences. J/22 has a comfortable self-bailing cockpit with 7 ft. long seats and room for 4-6 people in the cabin to escape the rain or cold. J/22 is also the key to financial success in managing public access sailing programs like Sail Newport. Such programs around the country can generate annual charter income on each J/22 nearly equal to its cost. People come back because they enjoy sailing a boat which is responsive, comfortable and dry for its size. J/22 is built for safety with buoyancy tanks and offshore hatches. Her 700 lb. lead keel lowers the center of gravity, creating nearly 1700 foot pounds of righting moment at 90 degrees of heel. There are over 1,550 J/22's now sailing in 65 active fleets in eighteen countries on three continents. Recognized by the ISAF, the International J/22 Class Association promotes activities and regattas worldwide. There is a very active class web site and association newsletters. For class racing, sails are restricted to only a main, small jib and spinnaker with total crew weight at 605 lbs. 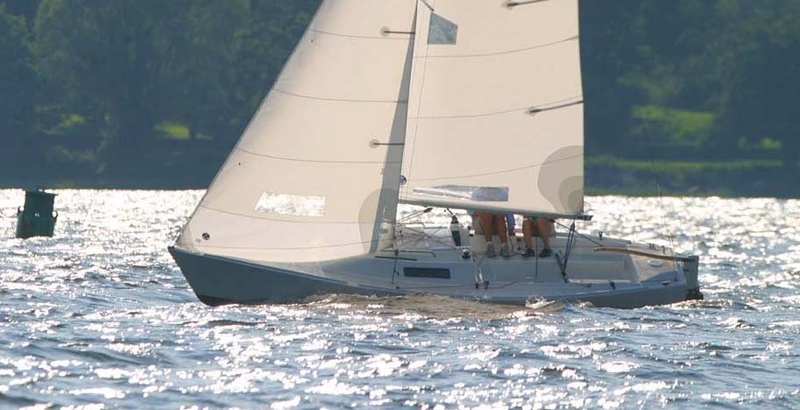 There is still no better One-Design value available in a 22' keelboat.